Meet the buntings: Old World bunting, New World bunting, and bunting family members who don't bear the bunting name. And some birds called buntings actually aren't. Typical among these birds is the fact that males have brilliantly colored feathers. Females and juveniles have duller colorings. Bunting identification has as much to do with your location as it does with the plumage. Most buntings are classified with the family of cardinals, but many are not. Making identification of species harder, buntings interbreed and create hybrids. The indigo bunting (Passerina cyanea), the smallest blue-colored bunting, is uniform in color with a silvery beak. The female is brown with a streaked chest. Indigos breed in nearly 2/3 of the United States during summer. The larger lazuli (Passerina amoena) breeds in the Northwest. The lazuli males have blue heads, white chests and rusty-colored bibs; wings have some white. Females are grayish brown with lighter-color bibs. The blue grosbeak (Passerina caerulea), while not called a bunting, is family. The male is blue with chestnut coloring on the wings. The female is mostly brown. These grosbeaks breed in summer in the lower half of the United States. Male painted buntings (Passerina ciris) have blue heads, red chests and backs of green and yellow. Females are greenish yellow with distinctive rings around the eyes. They use their short beaks to forage in grasses in the southeastern United States. Varied buntings (Passerina versicolor) are smaller and duller than their painted cousins, the males sporting brilliant indigo heads. They inhabit Mexico. They're called buntings; but the snow bunting (Plectrophenax nivalis) and McKay's bunting (Plectrophenax hyperboreus) are classified with sparrows. MacKay's buntings are a rare Alaskan-only find. 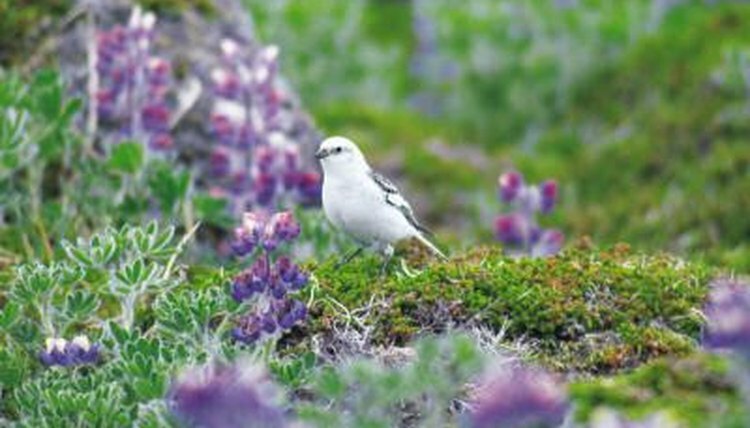 Males are whiter than male snow buntings and have black-edged wings. Snow buntings winter in the northern United States and Canada, and breed in Alaska and Arctic regions. Breeding males are white with black on their backs. Females and nonbreeding males have white and brown plumage. The blue bunting (Cyanocompsa parellina) sometimes appears in Texas. Ornithologist Kenn Kaufman says the blue bunting might look like the indigo bunting, but the blue bunting's beak is thicker and stubbier. The lark bunting (Calamospiza melanocorys) resides in the Great Plains. The male has a distinctive black body with white wings during breeding season. Off season, the male and female look more like common sparrows. The Old World buntings inhabit Eurasia and Africa.